forest-dependent species should be able to persist throughout their range, equally in landscapes dominated by production-forests as in landscapes dominated by reserves. We focused on the mature-forest element of biodiversity, because mature forest is more likely to be in short supply in production-forest landscapes than is younger forest. 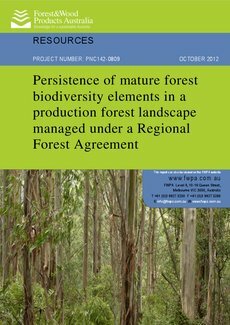 Our assumption is not that production forest must support mature-forest biodiversity in all places at all times, but that any local losses arising through forest harvesting should be temporary, with all areas of native forest at least retaining the potential to regain over time those lost mature-forest species. In this respect, species dynamics after forest harvesting and regeneration can resemble species dynamics after wildfire and forest regrowth. (ii) that the recolonisation of silvicultural regeneration by mature-forest species would be independent of the intensity of disturbance in the surrounding landscape. We then used the findings from testing these hypotheses to suggest some simple metrics and other planning tools that could guide future management and planning in relation to the spatial and temporal arrangement of mature forest in production-forest landscapes.